The Prince Albert Hotel, Queen Street, Onehunga (left), 1878. Image taken looking south toward the Manukau Harbour. Reference 4-1384, Sir George Grey Special Collection, Auckland Library. The Prince Albert Hotel which was at 289 Queen Street/Onehunga Mall in Onehunga began, according to Onehunga historian GGM Mitchell in Manukau Progress (1960), as the “Prince Albert Inn”, built by Edward Stallard the first publican in 1858. 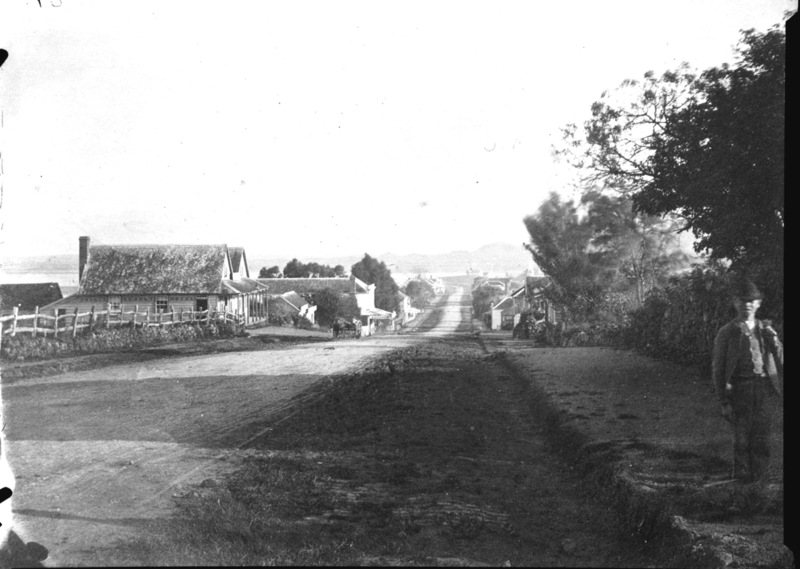 Queen Street itself in Onehunga appears to have been brand-new in 1857, and one of the natural volcanic caves was said to have been underneath the hotel. Important community meetings were being held at the Onehunga Prince Albert Hotel by 1858 – without any indications in the newspapers as to a license being granted, or when. Stallard had the hotel up for sale of lease in 1860. In 1862, the hotel and surrounds were again up for sale. The Hotel contains 12 rooms, all lined and ceiled, and a large Kitchen. The Out Offices consist of 2 large Stables— two newly erected and commodious Hay and General Stores, and a new Dairy. There is an excellent garden and orchard, well stocked with Fruit Trees. The Allotment contains one acre of land. The hotel was “a two-gabled structure with a deep gutter running the full length of the building at a right angle to Queen Street. There was a roomy bar, a dining room, four bedrooms and kitchen facilities – all on the ground floor. The gables were entered by separate stairways as there was no connecting passage from one to the other. There were six bedrooms upstairs which were said to have been poorly lighted, attic windows at each end of the gables providing ingress for the little daylight that could filter through to the interior,” according to a grandson of Stallard’s c.1910. The hotel appeared run-down and dilapidated within 25 years of its construction. By December 1883, the hotel was run by James Smith, when an argument over a card game began which ended with bullets. For a time, Onehunga became Auckland’s version of the American Wild West, and made headlines around the country. 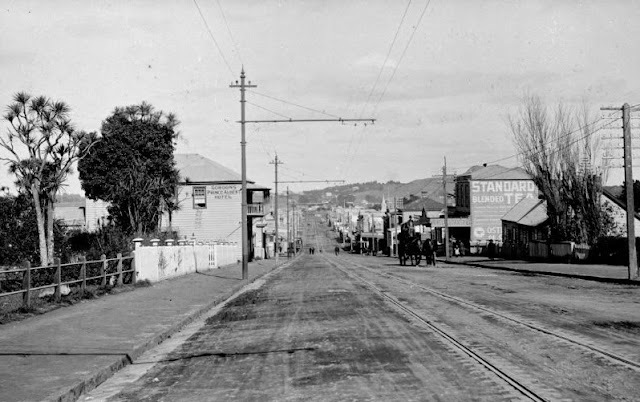 Before two o'clock William Henry Jones, the manager of the Onehunga Ironsand Works at Onehunga, was in the Prince Albert Hotel, Queen-street, Onehunga, kept by Mr James Smith, in company with a Mr Ploughman and John McDermott. Ploughman left them in the hotel playing a game of cards—euchre. It appears that Jones and McDermott had some row over the game, and hot words ensued. McDermott says that Jones struck at him, and then he struck Jones. A scuffle or fight seems to have taken place, and Jones' cheek was cut and his eye blackened. Jones then made use of some threats towards McDermott, and went down the street towards his residence in Church-street. McDermott returned into the hotel, and remained there for a short time—about 20 minutes—and then got on his horse to ride down towards the wharf. It is surmised that in the meantime Jones went home and armed himself, having first gone into a house to wash the blood off his face. McDermott, when riding down the street, saw Jones some distance off, but did not address him, but seeing Jones turned his horse's head to ride back. Several shots were then fired—some say three, and some four—out of a revolver by Jones, and that some of them took effect was evident from the fact that McDermott cried out that he was shot and galloped away to his home. It may be explained that the shooting took place in Queen-street, nearly opposite Mr. Oates’ boot manufacturer, and McDermott resides on the outskirts of the settlement, near the Royal Oak Hotel, and fully half a mile distant from this spot, which is just at the rise of the hill, below the Hibernia Hotel. McDermott got home, and Dr Scott was sent for. He examined the man, and found a bullet wound on the back, at the side of the spinal column, and got the bullet out from under the skin under the left arm-pit, where it had lodged. There is a second bullet wound through the left thigh from side to side. There were several people in the street when the shooting took place. Dr Scott considered the case critical, as it was not ascertained whether the ballet, from the principal wound, had penetrated the lung or injured it. Shortly after the occurrence Jones was arrested by Sergeant Greene and Detective Walker, who happened to be in Onehunga on other business, and the man brought to the lock-up. He was quite cool and collected, and apparently not under the influence of drink, but he made no statement. Jones was sentenced to 14 years in gaol in April 1884 for shooting with intent to murder. There was yet another series of publicans: J Bradley took over the hotel license in June 1884. By 1888, Charles Joseph Molloy was the publican there. Charles Meehan took over in 1890, then John Lloyd in 1891. Around this time, Mitchell says, the old hotel was demolished and a new one built by Enright & Campbell. Edward Stallard died in 1894, after bitter disputes with his wife Ellen over savings accounts the year before. Ellen Stallard took over ownership from the surviving trustees until her own death in 1910. Mrs Annie Ziegler took over the hotel’s license in 1895, then Nicholas Brown from that year. There was another series of publicans coming and going: 1897, Stephen Keogh; Thomas Keogh in 1898; Joseph Schollum 1901; George Dalziel, 1902. In January 1904, Campbell & Ehrenfried advertised tenders for additions and alterations to the hotel. After this, the hotel boasted 17 rooms. (Auckland Star, 2 May 1907) More publicans: John James Russell from 1906; William George Rae from late 1907; Thomas Foley late 1909. The hotel narrowly escaped losing its license in the 1909 local reduction. Campbell & Ehrenfried took title from 1911 from Ellen Stallard’s estate, and all the furnishings at the hotel were sold up in March 1912. Postcard image, courtesy Lyn Dear showing "Gordon's Prince Albert Hotel" on the left (looking south, as in the top image). As Bernard Gordon was licensee only in 1914-1915, this would likely be the period of the image. The hotel was bought by William James Brewin who applied for a license for the hotel April 1912. Bernard Gordon took over the license in 1914, but Mary Hislop applied in 1915. She transferred to George Toyne Harris later that year. He transferred in 1917 to Horace Garsten, who then transferred in 1918 to Arthur Kerr. Then Norman Cunningham in 1921, Thomas Glanville in 1923, William Jury 1924, George Page 1925; John William Macdonald 1926; and Hugh McGahan 1928. McGahan apparently bought the hotel from a Mr Jury, who had purchased; he died there 8 November 1941. His widow Esther Ivy Rubena McGahan applied for the hotel license in April 1942, and retained it until 1946, assisted by Edward Drum. Under L G Gallagher (Dominion Breweries), after considerable planning and discussions between Dominion Breweries and the Licensing Committee, the Prince Albert Hotel was closed 1 October 1959, demolished, and replaced by the £200,000 Onehunga Hotel by mid 1960, just alongside the old site to the south. This in turn lasted through to around 2001 before it, too, was either demolished or became just part of the fabric of the building complex there today. John Macdermott was my great grandmother's brother. His father also John Macdermott was a New Zealand Fencible. The violent quarrel between Macdermott and Jones is quite a story!!! Was William Macdermott related to your great grandmother? My great great grandfather who moved to Auckland from the Hokianga and surrounding areas looking for work got a labouring job building Prince Albert Inn I suppose along side Mr Edward Stallard Onehunga..
John Mcdermott was my grandmothers uncle. Johns parents were John and Catherine who had many other children (approx 10) Catherine came to NZ age 3 from Roscommon Ireland. Dont know anything about John Mcdermott senior. Any info would be great. It's all right asking for info -- but more of you "Unknowns" and "Anonymous" folk should include an email contact so people can get in touch with you to give you the info you're asking for. Just saying. I have tons of times on record where people have asked how to get hold of someone -- and it's impossible.